School of Electronics information Engineering Harbin Institute of Technology Harbin, China. ing targets. The simulated results demonstrated the validity of the algorithm proposed. targets are used to reconstruct radar images. engineering because of a huge amount of computation. there is cross-term interference associated with the WVD. results demonstrate the validity of this algorithm. target is illustrated in Figure 1.
any imaging procedure can be performed. in the reference  and . 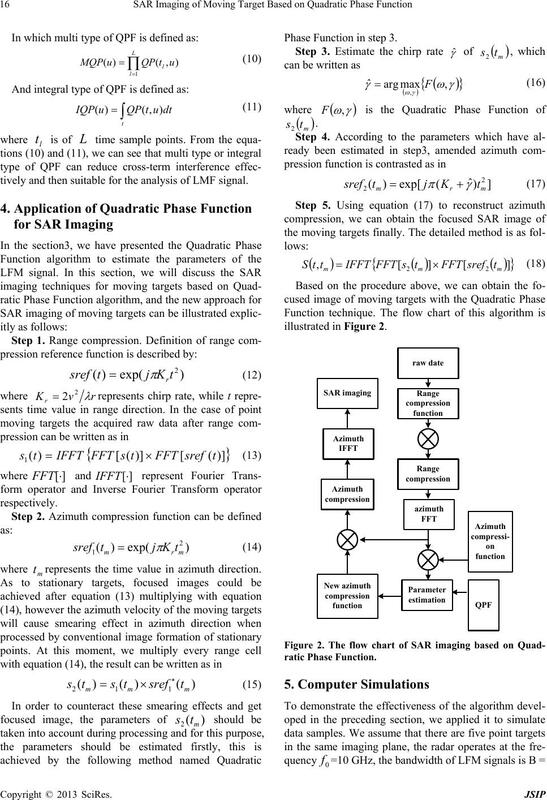 tively and then suitable for the analysis of LMF signal. where mrepresents the time value in azimuth direction. 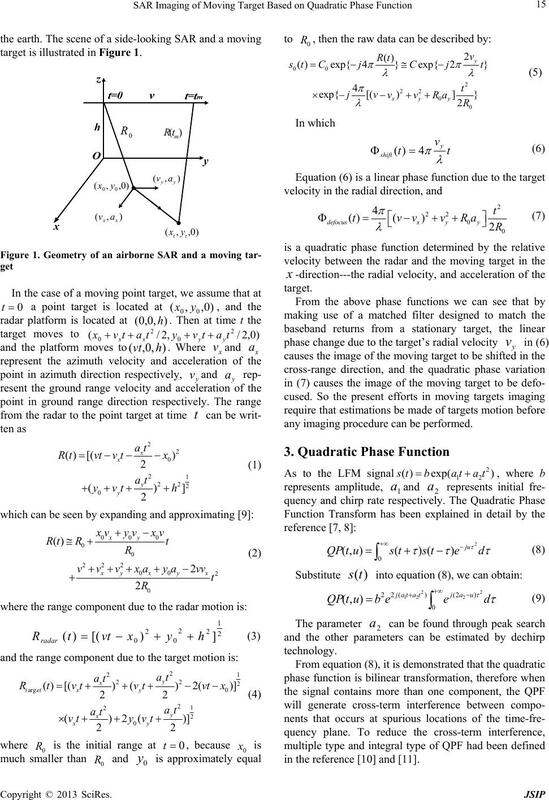 Phase Function in step 3.
parameters of the targets are given in Table 1.
we can see that the image is blurred in azimuth direction. Figure 3. 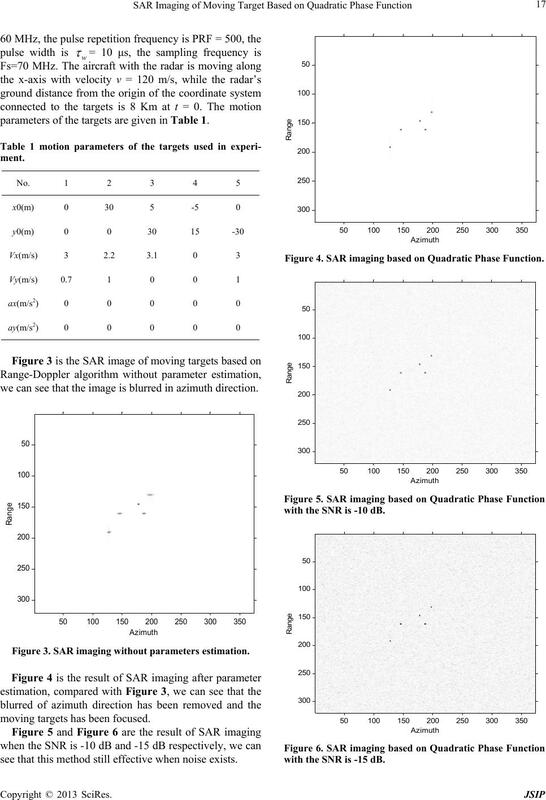 SAR imaging without parameters estimation. moving targets has been focused. see that this method still effective when noise exists. Figure 4. 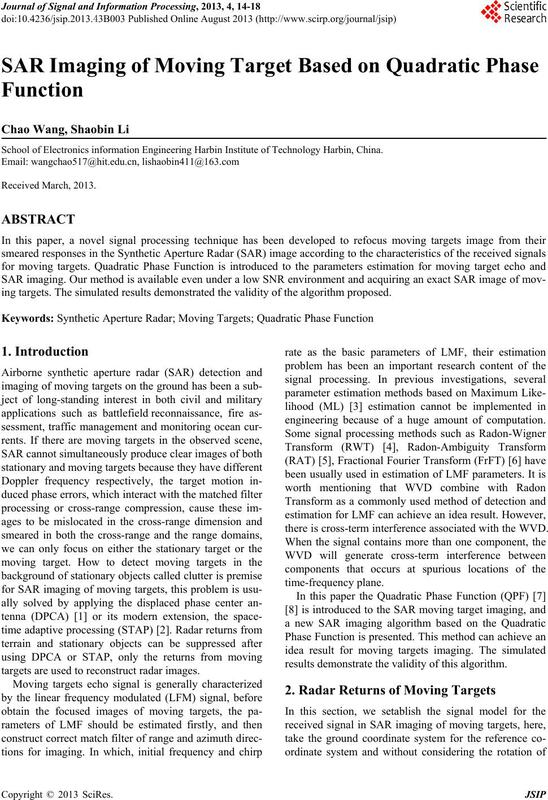 SAR imaging based on Quadratic Phase Function. with the SNR is -10 dB. with the SNR is -15 dB. numerical experiments using simulated data. actions on Aerospace and Electronic System, Vol. 22, No. 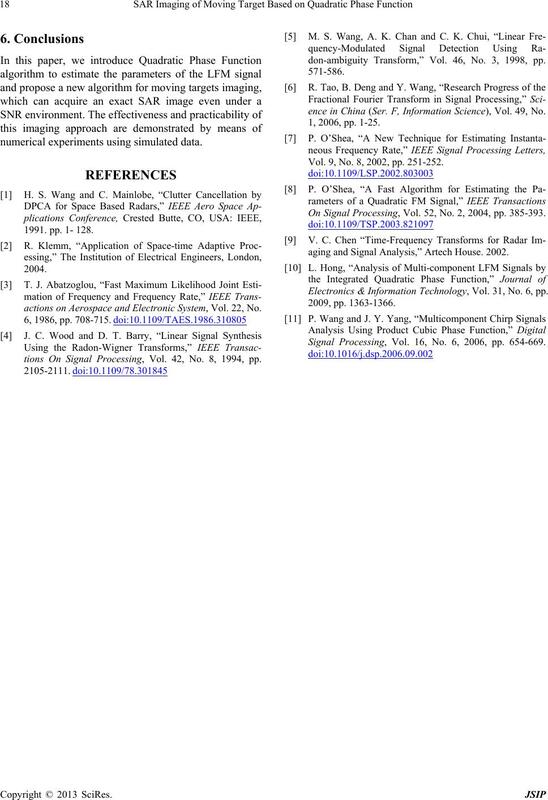 tions On Signal Processing, Vol. 42, No. 8, 1994, pp. don-ambiguity Transform,” Vol. 46, No. 3, 1998, pp. ence in China (Ser. F, Information Science), Vol. 49, No. Vol. 9, No. 8, 2002, pp. 251-252. On Signal Processing, Vol. 52, No. 2, 2004, pp. 385-393.
aging and Signal Analysis,” Artech House. 2002. Electronics & Information Technology, Vol. 31, No. 6, pp. Signal Processing, Vol. 16, No. 6, 2006, pp. 654-669.